High Intensity Interval Training, or HIIT to you and me, has actually been around since the 1970s, when it was widely recognised that a number of athletics coaches (including Seb Coe's dad, Peter) borrowed principles from German athletics wunderkind Woldemar Gerschler. It's now having a big moment in the sun and with the New Year coming up, could be a great choice for fulfilling those 'resolutions'. You may have seen the annoyingly ripped folk in your local gym performing sweaty bouts of interval training, or perhaps there's a small group who take to your local park to run around like lunatics, only to flop on the floor for 20 seconds and repeat. 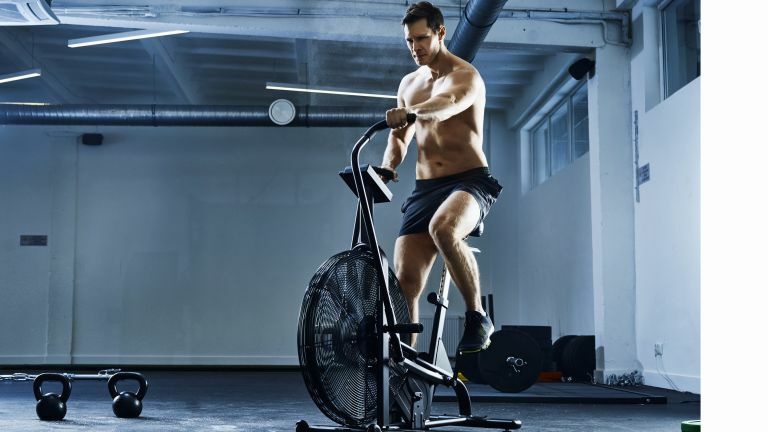 There are numerous iterations, including the Japanese Tabata regimen, and the great thing is you can do HIIT indoors or out, either using minimal/no equipment, or going full gear head with loads of high-tech HIIT-focussed equipment. Whatever your approach, all HIIT workouts focus on short bouts of intense exercise followed by (usually even shorter) periods of rest. Fitness expert Julia Buckley explains: "Sessions are usually short, typically less than half an hour in duration, with intervals typically lasting 15-60 seconds. It's simple, but really tough – and if you're not finding it tough, you need to push harder." Why is HIIT good for me? Apart from being an incredibly efficient way of training (you can easily squeeze a tough HIIT session into 30 minutes), it has also been proven to deliver some serious flab-busting results. "According to the American College of Sports Medicine, just two weeks of HIIT can improve aerobic capacity as much as six to eight weeks of endurance training," explains Buckley. "In a nutshell, you get more fat burning and better fitness gains from shorter workouts. Just 15 minutes of HIIT can torch more calories than an hour of slow plodding on a treadmill," she adds. Of course, results will vary depending on the individual and the amount of effort they put into each session, but the key to any workout is exertion... and plenty of it. What are the best HIIT workouts? The beauty of HIIT is that most exercises can be incorporated in some way. So long as they sufficiently raise the heart rate in a short period of time, you are golden. "There are no specific HIIT exercises," says Buckley. "That said, bodyweight strength and cardio moves work really well, because in these exercises you can push your body to its limits fairly quickly and you don't lose valuable seconds messing around with equipment." Speak to any personal trainer about their favourite HIIT moves and it's likely you'll hear burpees, mountain climbers, squat jumps and sprints liberally sprinkled into the conversation. • Set a timer for alternating intervals of 40 and 20 seconds. Perform each exercise (below) for 40 seconds then rest for 20 before moving onto the next. • Take a 60-second break after you complete the circuit before repeating. • Complete 4 rounds for a 20-minute HIIT blast. What's the best equipment for HIIT? Another upside of HIIT is that you can fit a cheeky session into the more mundane cardio machine workouts, meaning it's possible to call upon the running machine, stationary bike, cross trainer or rowing machine. "My favourite for HIIT is the stationary bike, because you can really push yourself to the point were your legs start to feel weak and a little wobbly, which would be dangerous on a real bike or on a treadmill," says Buckley. We reckon the Wattbike Atom is the best home exercise bike, simply because it gives the most realistic experience currently on the market. Yes, we know that the key to getting buff and totally pumped is to lift heavy weights, but performing intense bouts of interval training with dumpy dumbbells is probably not a good idea. Weights training should generally be slow and considered to ensure you're targeting the exact muscle groups without risking injury. That said, CrossFit fans will attest to the cardio benefits of weighted exercises like barbell thrusters, kettle bell swings and a heavy dumbbell overhead press, but these should only be factored into a HIIT routine by the initiated. "Make sure you're going at the right intensity," explains Buckley. "Where most people go wrong with HIIT is in not pushing hard enough. Sometimes the fittest people can be the worst culprits - especially if they have a background in endurance training or are used to longer workouts. "They're so used to saving energy for the long haul, it takes them a while to find the higher gear they need to get into in order to go all-out in shorter sessions. "If you find it easy, or finish feeling like you still have energy in the tank, do not make your sessions longer, instead push harder," she says. There you have it: wise words from a keen HIIT advocate. So what are you waiting for? Get out there and wage war on flab. You can see more of Julia on her website juliabuckleyfitness.com or by following her on Instagram where she posts lots of HIIT-related routines.